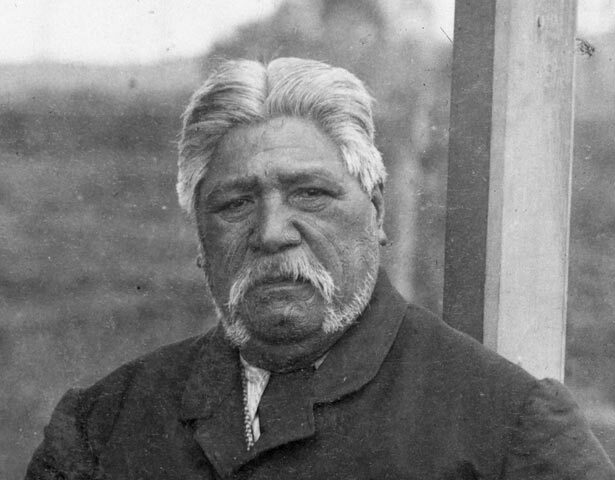 Wahanui Huatare, of Ngāti Maniapoto, was born in the late 1820s. Raised as a Christian, he also became a notable tohunga (Māori spiritual expert) and an influential chief. In the 1850s he organised a mail service between Te Awamutu and Napier, and set up a system of tribal administration and law enforcement which was admired by John Gorst, the Waikato resident magistrate. Near the end of the 1850s Wahanui became opposed to further European settlement, and became a key figure in the growing King Movement. He fought in the Waikato war of 1863–64, and was wounded. After the war Wahanui's diplomatic skills were in demand. In 1881 he spoke for the King when peace was finally made. He remained strongly opposed to land selling, but realising that European settlement within the King Country could not be prevented, he tried to limit and control the process of land alienation. In 1883–84 Wahanui agreed to provide land for the main trunk railway. Premier Robert Stout had promised to make the King Country a "dry" area (free from alcohol). Stout had also assured Wahanui that the Native Land Court would be kept out of the district. Māori referred to this as a "compact". The government later either ignored the promise to exclude the Land Court, or denied that Stout had ever agreed to it. In the end, Wahanui's attempts to engage with the European system in a manner that preserved the authority and the land of his people ultimately proved unsuccessful. He died in 1897. I whānau mai a Wahanui Huatare i te paunga o te tekau tau atu i 1820. Ko Ngāti Maniapoto tōna iwi. He Karaitiana ia, he tohunga rongonui, he rangatira whai mana. I te tekau tau atu i 1850 ka whakatūria e ia tētahi kawenga mēra atu i Te Awamutu ki Ahuriri. Ka whakatūria hoki e ia ētahi tikanga, ētahi ture hei whai mā te iwi. Ka whakamihi te kaiwhakawā ā-rohe i Waikato a Te Koohi (John Gorst) mō tēnei kaupapa. Kia tae ki te paunga o te tekau tau atu i 1850 ka tīmata a Wahanui ki te ātete i te noho a te Pākehā. Whai anō he tūranga taketake tōna i te Kīngitanga, i te kaha nei tōna tipu. Ka whawhai, ka taotū ia i ngā riri i Waikato i te wā 1863-64. I te mutunga o ngā riri, ka manakotia a Wahanui e te iwi mō tana tohungatanga ki te whakahaere me te whakatau take. I te kapinga o ngā riri i te tau 1881, ko Wahanui ka tū, ka whakatakoto kōrero mō te Kīngi. Ka mau tonu tana whakahē ki te hokonga whenua, heoi, kua mārama kē ia, e kore e tareka te aukati i te kuhu a te Pākehā ki te Rohe Pōtae. Ka ngana ia ki te āta whakahaere i te hokonga o ngā whenua. I te wā 1883-84 ka whakaae a Wahanui kia tukua he whenua mō te rerewē matua. Ko te kī taurangi a te Pirimia a Rāpata Taute (Robert Stout), kāore e whakaaetia te waipiro ki te Rohe Pōtae, kāore hoki e whakaaetia te Kōti Whenua Māori me ana mahi kia kuhu ki te Rohe Pōtae. Kīia ai tēnei āhuatanga e ngā Māori he “whakaaetanga”. Nō muri ka hoki kōmuri te kāwanatanga, kāore ia i aro atu ki tana kī taurangi e mea ana e kore te Kōti Whenua Māori e kuhu ki te Rohe Pōtae mahi ai i ana mahi. I tua atu, i whakapae rātou kāore i whakaputahia e Taute ēnei kōrero. I te mutunga, hauwarea ngā mahi a Wahanui ki te pupuri i te mana me ngā whenua o tōna iwi. Ka mate ia i te tau 1897. We have 40 biographies, 4 articles, 1 comment related to Wahanui Huatare. King Tawhiao prohibited the use of alcohol in the King country, and this was supported by all other significant chiefs of Tainui. Wahanui, Rewi Maniapoto,Taonui included. This was enforced right up to 1954, despite bootlegging and the such. More so when soldiers returned home after WW2. This Rahui or Tapu was never lifted. Pubs and clubs etc in the King country struggle to make any profits .Maori in the area are now over represented in Aod statistics. It has only taken 2 generations for this to become a major health issue for King country maori, which some say is the cost for not adhering to this Rahul or prohibition within Te Rohe Potae. Tawhiao,and Wahanui were Maori prophets, tohunga of old whom had foresight and could see how alcohol would effect their people.